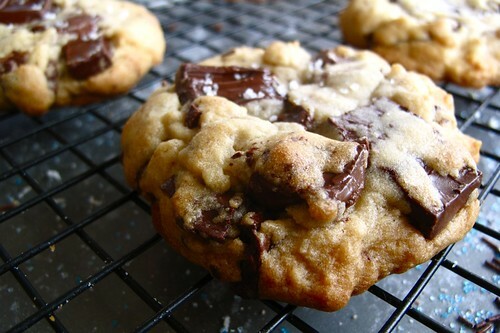 The pursuit of the perfect chocolate chip cookie recipe is something that many bakers undergo at one point in time. I am lucky in that I did not have to search very long or hard for my perfect chocolate chip cookie recipe. First, I tried one of Alton Brown's chocolate chip cookie recipes--"The Chewy." It wasn't bad, but it wasn't mind-blowing either. The recipe called for melting the butter instead of creaming it. This was supposed to make the cookie chewy. I wasn't very impressed by the result. A few weeks ago, I came across a chocolate chip recipe on the New York Times website by Jacque Torres, a renowned chocolatier. The man is French. He makes his own chocolate from raw cocoa at his shop in New York. I didn't need to read the recipe twice to know that I had to try it. The most interesting thing about this recipe is its use of cake flour (a low gluten flour) AND bread flour (a high gluten flour). Why not just use all-purpose flour whose gluten level is in between the two? Don't use all-purpose flour. I believe the ingenious use of cake and bread flour made all the difference in this recipe. It made for a chewy, not-overly-cakey, thick cookie. Also, this recipe called for the sprinkling of coarse sea salt on the cookies before baking in addition to a significant amount of salt in the dough itself. Again, ingenious! The saltiness made the flavor chocolate even more intense. I couldn't stop myself from taking bite after bite even while consciously thinking about the amount of butter in the recipe and my growing waistline. It's that good. Lastly, the recipe called for chocolate "disks" or Valrhona feves instead of simple chocolate chips. 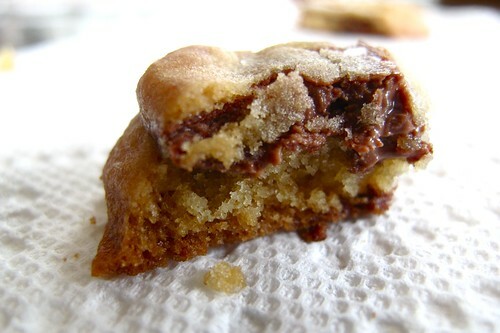 This allowed the cookies to have layers of chocolate instead of random chunks of chocolate here and there. I found milk chocolate Valrhona feves at Whole Foods but they were pretty expensive and I had actually wanted to use bittersweet chocolate. I bought 1/3 of a pound. Valrhona is my favorite brand of chocolate. For the rest of the chocolate, I used Ghirardelli chocolate bars in semisweet and 60% bittersweet--roughly chopped. When forming the balls of cookie dough, I took my time to arrange the chocolate pieces so that they not only came out pleasant looking, but also had those layers of chocolate. I made 2 ounce balls of dough which resulted in a 3-inch cookie rather than the huge cookies proposed in this recipe. I followed all the weighted measurements. I no longer trust cup measure. Measuring by weight ensures a consistent product. I baked off some of the dough after 24 hours, 48 hours, and 72 hours. The 72 hour batch tasted the best by far. For some reason, the dough develops an almost toffee-like flavor after sitting in the fridge for a long period of time. It makes for a cookie with more depth and complex flavor. My 2 ounce mounds of dough needed about 15 minutes to bake in the oven. 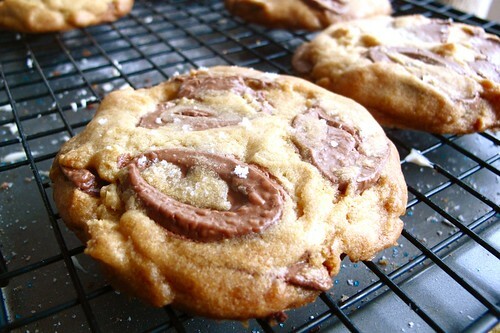 I think I am the only person in the world who hasn't made these cookies yet. Must remedy that this year! I'm getting a sugar buzz just looking at the photos. And drooling a little too. Yum! It is never a good idea to read a post about chocolate chip cookies (perfect or even just so-so) right before bed! I am now tempted to ditch my bedtime, just to make these. Of course, I have to wait a day or two anyway to bake them, so I guess I can hold off trying the recipe until tomorrow (although, the allure of cookie dough is strong, too). Thanks for sharing and also for your insights about chocolate. The right chocolate can make all the difference, too. YUM YUM YUM!!! 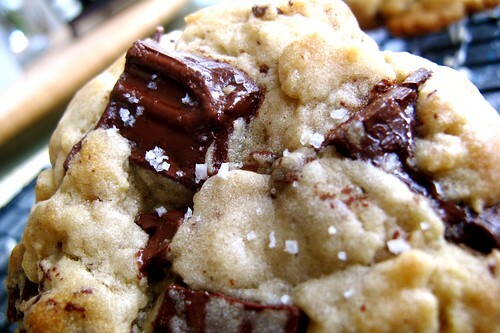 How perfect, I post a sugar cookie recipe and now you have the best chocolate chip recipe! I will be trying this for sure :) I love your blog, very cute and great pictures!!! Did you make half the recipe with the Ghirardelli chunks and half with the other? I just made these and they are otherworldly! Seriously, I feel like I'm at a cafe in NYC and I just paid five dollars for this cookie. And it's worth it! The cookies were fantastic the day I made the batter. That was two days ago. Today I made another small batch and they are utterly unbelievably fantastic. I'm going to have a very very hard time going back to Toll House's recipe after this. You've ruined me! I used Valrhona feves in milk and dark chocolate. I love the milk chocolate the most. But I think next time I'll try something less expensive. Anyone have any ideas what the usual combination of flours is doing for this recipe? The bread flour has me especially puzzled as it's normally reserved for baked goods that do well with a high protien/gluten flour. What's a cookie to gain from bread flour?? I just saw a recipe for tart dough that used cake and bread flour as well. i think the cake flour keeps the cookie tender while the bread flour provides a little bit of that chewy texture...that's just my guess. there's some kind of chemistry going on there. You mentioned that you weighed your ingredients instead of using the cups. The cake flour calls for 2 cups minus 1 tablespoon and in the parenthesis it says 8.5 ounces. 1 cup is equivalent to 8 ounces, so did you put 8.5 ounces of cake flour or 15 ounces? I've tried the dough that was chilled in the fridge for 72 hours and it was pretty darn good. Thanks for the suggestion!